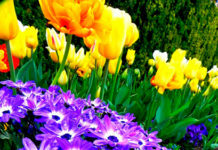 Thanksgiving Point presents the 14th Annual Tulip Festival at the Ashton Gardens, from April 13-May 5 (closed Sundays). Nearly 300,000 tulips, in over 100 unique varieties, are spread across the 55-acre Ashton Gardens for the Tulip Festival. Golf carts, wheelchairs, electric scooters, and Segways are all available to rent. The Tulip Festival is one of the most popular events in Utah with more than 100,000 guests visiting each year. The tulip display is redesigned with tulips imported directly from Holland to create a new display each festival. At the Tulip Festival’s conclusion, the tulip bulbs from the event go on sale for four dollars per dozen to create mini Tulip Festivals in yards all across Utah. This year’s Tulip Festival includes 10 different “beats” that showcase the magnificent varieties of tulips in creative ways. Antique tulip bulbs more than 400 years old will be on display in a living museum. In the Learning Garden, guests can cut their own bunch of tulips for $10 a bunch while supplies last. 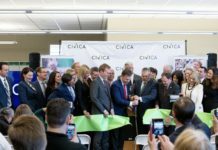 Every Friday and Saturday during the Tulip Festival, there will be a Festival Market in the Waterfall Amphitheater with vendors and food trucks from all over the state and children’s activities in the Tulip Tot Playland. On April 27 and 28, Dutch Days will be celebrated at the Tulip Festival with authentic Dutch food, music, and storytelling. There will be a 5K and Kids Fun Run on Saturday, April 28 as well. 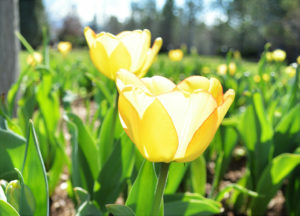 The Tulip Festival hours are 9 am to 8 pm, Monday-Saturday. Thanksgiving Point members can enjoy early admission from 8am-9am to walk the Festival prior to opening each day. Admission is $20 for adults, $15 for seniors and children aged 3-12. Military personnel get a 25 percent discount with valid ID as well. Entrance is free to Thanksgiving Point Members and children under two. The Ashton Gardens is located at 3900 North Garden Drive in Lehi, Utah.